430 pages | 5 Color Illus. | 233 B/W Illus. Viorel Badescu is affiliated with Polytechnic University of Bucharest. He obtained a PhD in Thermoenergetics (1993). Practiced as a mechanical Engineer in industry (1977-1982). Researcher and academic positions at Polytechnic University of Bucharest (1982-present). Reviewer for more than 50 scientific journals. Peer-reviewer for national and international research funding institutions (International Scientific Foundation, USA; National Research Foundation in South Africa; American Chemical Society Petroleum Research Fund; Applied R&D Grants, City University of Hong Kong; Cyprus Research Promotion Foundation; National Research Foundation of Korea; National Centre for Research and Development of Poland). Peer-reviewer for scientific programmes of the European Commisions (Leonardo Da Vincy, Marie Curie). Associate editor of scientific journals (Renewable Energy, Journal of Energy Engineering, Applied Sciences); Ex-associate editor of Energy, Space Power. Member in the editorial team of several international journals. Editorial policy consultant for Elsevier and Kluwer Academic Publishers. Editor of books published by Springer and special issues in international journals. Co-organizer of the World Renewable Energy Congress. Member in various international commissions and committees. Invited lecturer at international congresses and conferences. Member in national and international societies (International Solar Energy Society, European Astronomical Society, European Water Resources Association, International Radiation Physics Society). Recipient of the 1979 Romanian Academy Prize for Physics and other prizes. Cited in many academic dictionaries and who’s who –like publications. Member of the Romanian Academy. 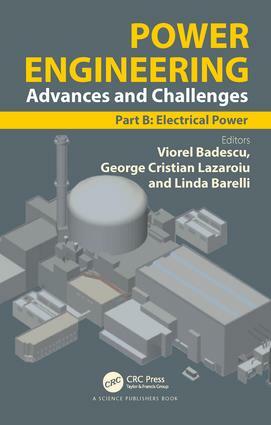 George Cristian Lazaroiu received his Diploma in Power Systems Engineering from University POLITEHNICA of Bucharest, Romania, in 2002 and his PhD degree in Electrical Engineering from Politecnico di Milano, Italy, in 2006. He is Associate Professor at the Department of Power Systems, University POLITEHNICA of Bucharest. He was Chair of 2014 ICHQP and will be the General Chair of 2019 Innovative Smart Grid Technologies Europe (ISGT Europe). He is a Senior Member of IEEE, member of IEEE Flicker Task Force, member and secretary of Energy Committee of Romanian Academy. His research focuses on power quality, distributed energy resources, optimization, electricity markets. Linda Barelli is an Associate Professor at Department of Engineering, University of Perugia. She received her Master’s Degree in Mechanical Engineering, with merit, in 2000 and was awarded the title of PhD in Industrial Engineering in 2004 from UNIPG. She was appointed as Energy Manager of the University of Perugia in the period 2005-2013. Awarded of the national scientific qualification as Full Professor in 2014. Her teaching activities mainly concern energy conversion systems. Her current research interests are stationary and dynamic modeling of cogenerative and hybrid energy systems; fuel cells-based systems; H2 production with particular attention to Sorption-Enhanced Steam Reforming, also from renewable sources, and dry reforming; energy storage; CCS technologies; control, monitoring and diagnosis of energy systems also by means of Artificial Intelligence techniques. She has authored over 70 publications, 44 papers in international journals and 5 patents (2 extended abroad). Editorial board member for: "Energy – The international journal", Elsevier; the Energy area of "The Scientific Word Journal" - Hindawi Publishing Corporation. Editorial review board member in "Artificial Intelligence Research" - SCIEDU.